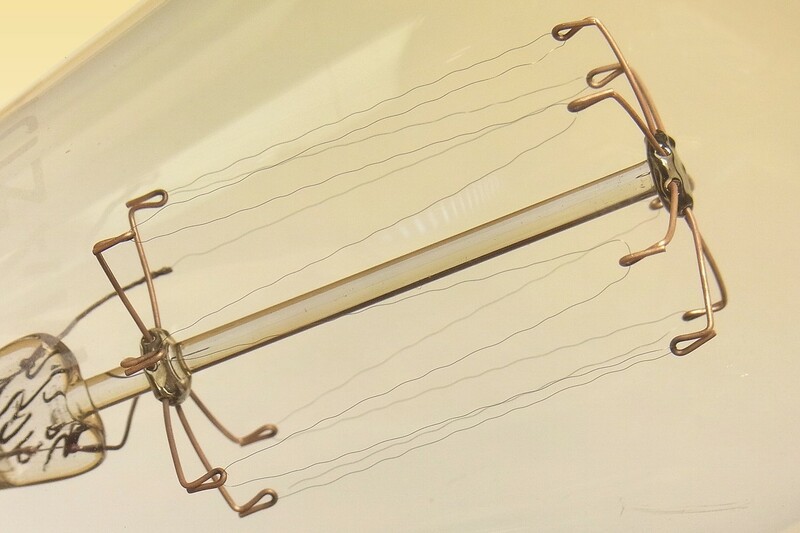 The filament of this lamp is made from drawn tungsten wire, produced according to the process developed by William Coolidge at GE in 1910. 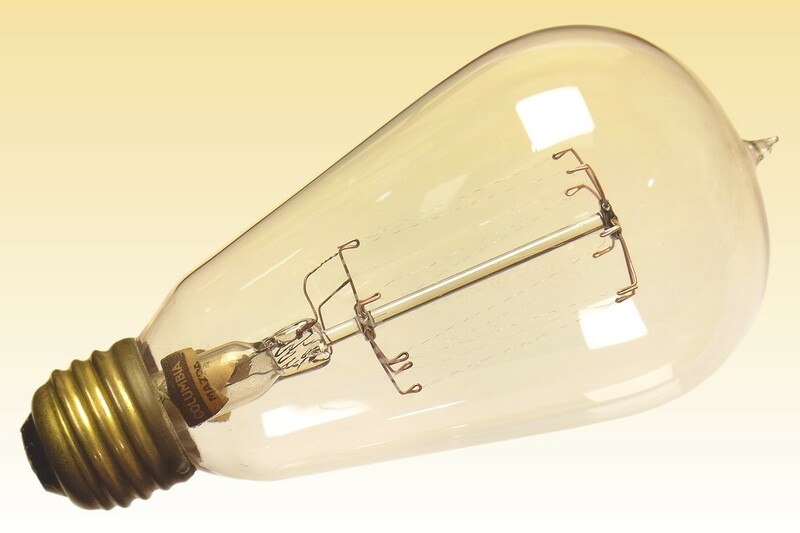 During 1911-1912 it superseded the company's earlier sintered tungsten lamps, which were made according to a technology originally developed in Europe that GE had been forced to license at enormous expense to remain competitive. However the Coolidge process achieved a better and cheaper tungsten wire, which put GE back in the dominant position of controlling pracially every other lampmaker worldwide via its patents. 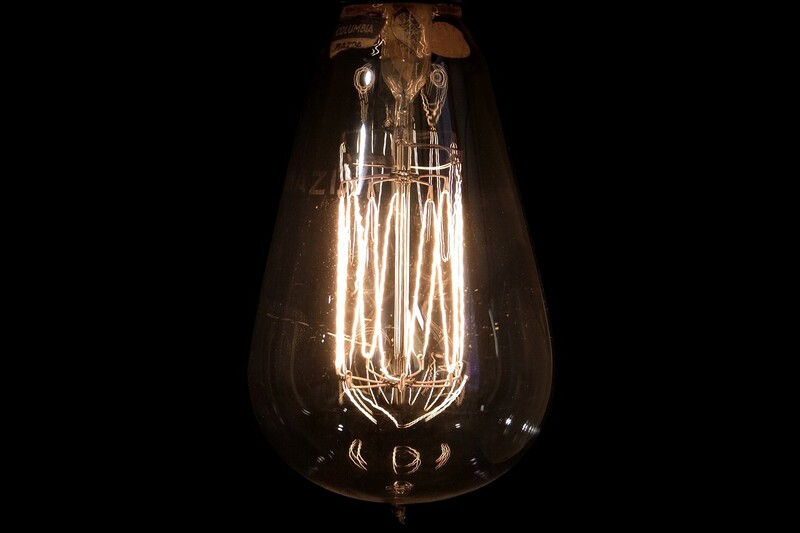 The squirrel-cage filament is loosely supported by heavy copper wires at both ends, in a style that is similar to the tantalum lamps previously made at the Columbia works. It has been attached to the lead-in wires by forming the latter into small tubes into which the filament is inserted, and then crimped. 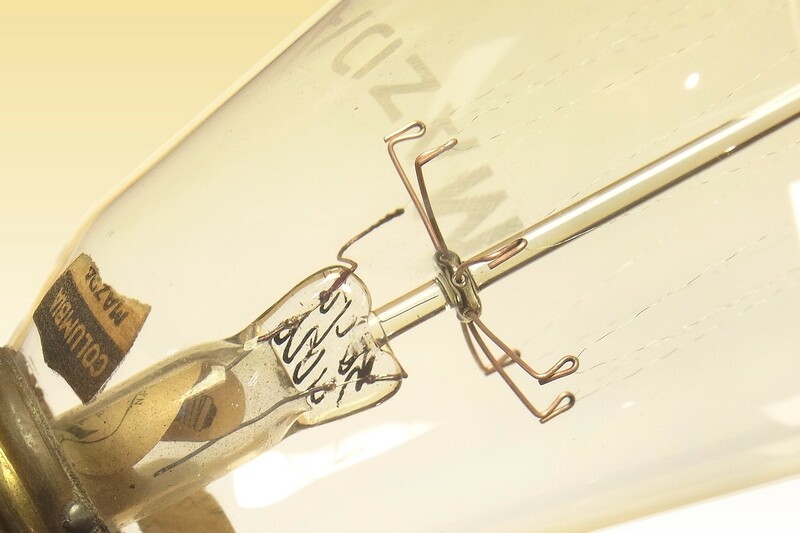 The filament displays the characteristic crinkled appearance of early drawn tungsten lamps. This relatively pure tungsten suffers uncontrolled growth of the crystalline grain structure when lighted on AC voltages, causing offsetting of individual grains and deformation of the wire. Due to the production date of 1912 it is suspected that the glass-metal seals of the stem are to a composite wire developed at the end of 1911 by Byron Eldred to replace the costly former platinum seals. 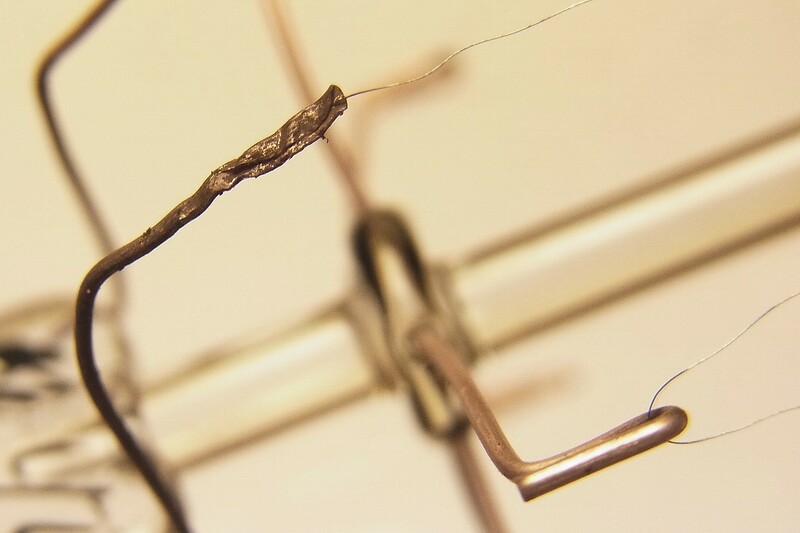 Eldred's wire consisted of a nickel-iron core having similar expansion to that of the glass, with a thin copper plating followed by a silver layer and finally a top coat of platinum - the latter being to improve the wetting of the wire by glass, and the intermediate layers being necessary for adhesion of the platinum. This was superseded by the superior Dumet wire in 1913. References: 1) The History of the Incandescent Lamp, J. Howell & H. Schroeder, The Maqua Press, 1927, pp.159-160.